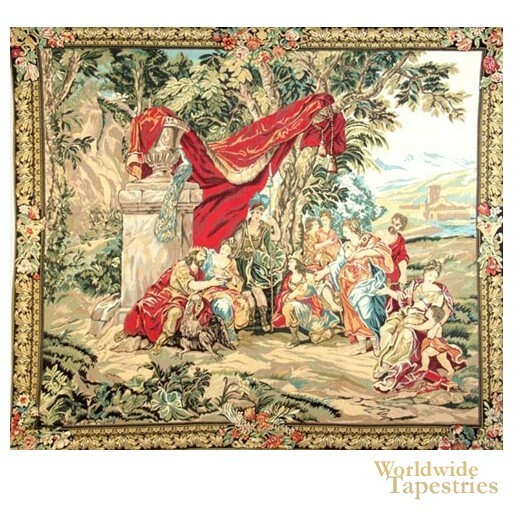 In Jupiter tapestry we see a mythological scene with Jupiter and his gods and goddesses. In Roman mythology, Jupiter was the king of the gods, and of the sky and thunder. He ruled over laws and social order. Here in this scene on the country side near a red drape, he councils his other deities in a scene inspired from mythology. This is an example of a tapestry which features the detailing of the foliage in verdure tapestries with the element of mythology. Jupiter tapestry is backed with lining and tunnel for easy hanging. Dimensions: W 52" x H 50"